Internet video ads, long a sideshow in the online advertising market, are gaining in importance to marketers and Web publishers as they look to capitalize on consumers' changing viewing habits and tap a $70 billion television market, said experts. The growing trend means websites like Google's YouTube, Yahoo and Hulu have a better shot at tapping the mother lode of television advertising budgets, though video ads have a long way to go before they become as dominant a part of the marketing landscape as TV ads. Research firm eMarketer says video is the fastest growing form of online advertising, with spending increasing 46 per cent last year, and outpacing popular formats such as search ads and display ads. Google does not break out financial results for its YouTube business, but CEO Larry Page said on Tuesday that spending among YouTube's top 100 advertisers increased by more than 50 per cent in 2012 compared with the year before. At Yahoo, "one of our highest priorities was to create more online video experiences, because that's where the demand is for advertising," said Tim Morse, the former Yahoo finance chief who became CFO of video advertising technology company Adap.TV this month. "It's the closest to what they've had offline. They're looking for the same kind of medium where they can connect with consumers," he told Reuters. "Last year was a bit of a turning point," she said, as Chevrolet put greater emphasis on creating original video ads and looking for new ways to distribute spots, rather than simply running existing TV ads on YouTube and TV network websites. For Web publishers, video ads are good business. While typical banner ad rates can generate a few dollars per thousand views, video ad rates can reach $20 per thousand views, said eMarketer's David Hallerman. "All of the Internet advertising to date has come from print sources," such as newspapers, magazines and yellow pages, said RBC Capital Markets analyst Mark Mahaney. "We're are at a point where television ad budgets are likely to come online." The explosion of new screens such as smartphones and tablets greatly increases the venues where consumers can watch video, whether they're at their desks or on a bus. And social networking, which makes it easy for users to share favorite videos, has given marketers added incentive to produce video ads that can gain additional exposure by tapping into the social slipstream. 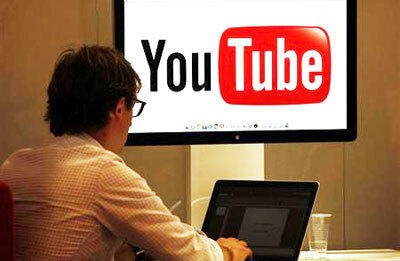 YouTube's head of industry development, Suzie Reider, said marketers are increasingly developing ads that are tailored for specific audiences, making it more likely that Web surfers will actually watch them. "We're living in a day and age where nobody has to watch an ad that they don't want to watch," said Reider. "You can skip them on the Web, you can skip them on TV." To make its website more appealing to advertisers, YouTube has helped create hundreds of "premium channels" featuring professionally produced video as opposed to the amateur clips YouTube is famous for. And it's developed a type of video ad that users can skip after five seconds - advertisers only pay if the ad is watched all the way through. Despite the growth in Web video ad spending, which eMarketer estimates reached $2.93 billion in the US last year, the firm said the spending still represents only about 10 per cent of the broader online advertising market. Analysts also note that the rich rates websites collect for video ads will decrease as more Internet sites open to ads - something that's already happening thanks to technology that automatically pairs ads with videos on websites.